HTCs One M8S measures 146.41 x 70.61 x 9.55 mms and weighs 160 grams. With a full metal unibody, the device fits comfortably in the hand. It has two stereo speakers at the front of the phone which when combined with dedicated amplifiers provide a great sound system. The device features Motion Launch which allows you to access apps with a single swipe or use voice control to make a call. By double tapping the screen, the device will wake up in order for you to check the time or the weather. 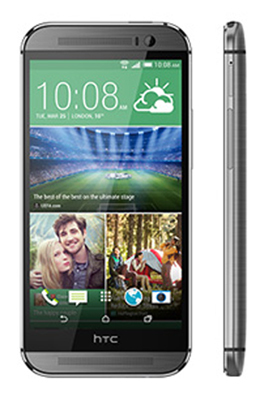 The HTC One M8S has an impressive 5 inch full HD display with a resolution of 1080 x 1920 providing a pixel density of 441ppi whichproduces bright, sharp images. This latest device from HTC, the One M8S, comes with 2GB of RAM and 16 GB of internal storage together with a microSD slot. The device runs Android 5.0 Lollipop and HTC Sense 6.0 and has a 64-bit Octa-Core Qualcomm Snapdragon 615 chipset. The device has a 2840mAh battery providing up to 753 hours of stand-by time (3G) and up to 20 hours of talk time (3G). The device features Bluetooth 4.0, NFC and Wi-Fi. The One M8S comes with a 13 megapixel camera with a 5 megapixel front camera. With HTC Eye Experience you can take selfies by using voice or visual cues. You can touch up selfies before taking a shot and even take shots using both cameras at the same time to take side by side photos and videos.